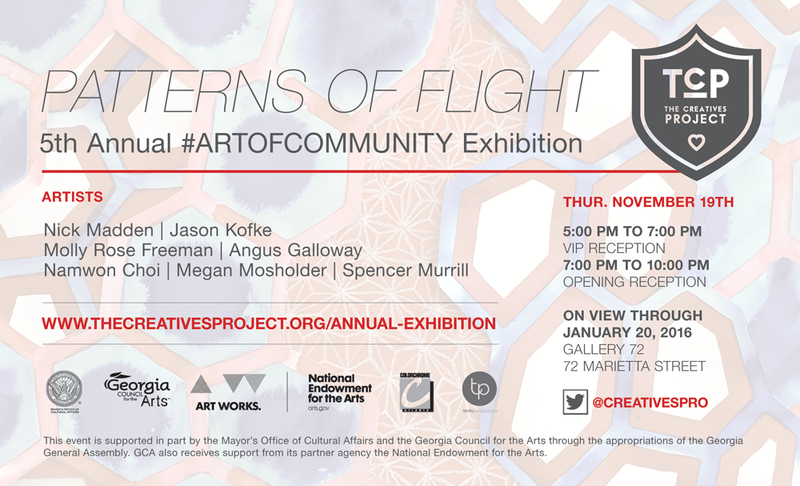 On Thursday November 19th 2015, GALLERY 72, in partnership with The Creatives Project, will open TCP's Annual #ARTofCOMMUNITY Exhibition; PATTERNS of FLIGHT. Inspired by their growth in creative collaboration, the show embodies the journey of our resident artists and how they have expanded and elevated their bodies of work. The artists will be on hand to lend a voice to their visual stories. 5PM- 7PM VIP DONOR RECEPTION: Support TCP with a donation below and the artists and TCP family will shower you with gratitude AND love, drinks, and yummy bites at this special patron reception. Learn more about how your donation above will support our annual campaign!!! Spencer Murrill is a lifelong enthusiast of weird and irreverent art forms from Watkinsville, GA. At an early age he became fascinated with puppet building and has carried that sensibility to a variety of art forms throughout his work. After acquiring a BFA in Sculpture at Georgia State in 2010, he took to painting murals, building graphic sculptures, and creating creatures to put on film. His current work combines aspects several of these disciplines. This program is supported in part by the Mayor's office of Cultural Affairs and the Georgia Council for the Arts through the appropriations of the Georgia General Assembly. GCA also receives support from its partner agency the National Endowment for the Arts.